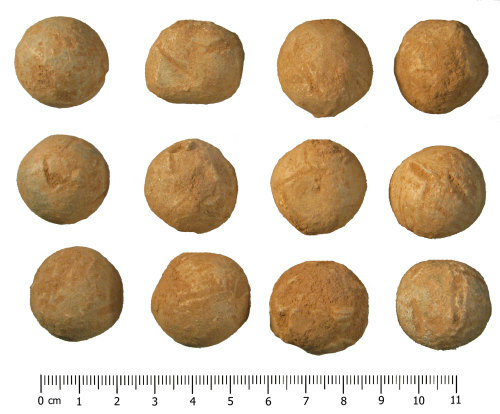 Twelve (12) complete cast spherical lead alloy probable Shot, of Post Medieval dating, circa AD 1600-1800. They were discovered in a 50 yard radius. They are broadly similar in size with some having a double grrove on one side. The lightest in this assemblage has a diameter of 25.15 mm and weighs 48.2 grams. This one has been flattened and is less spherical than the others. The largest in this assemblege has a diameter of 24.88 mm and weighs 67.8 grams. Another assemblage discovered in Worcestershire (WAW-A8D562) have some shots that exhibit a double groove along one side. These are suggested as Musket balls.